UNITED NATIONS, November 18, updated -- After a military dominated election in Myanmar, when the UN Security Council met about the country on November 18, some expected at least a statement to result, perhaps mixing diplomatic critique of the election with praise for the release of Aung San Suu Kyi. But when the Council session ended at 1:30 on Thursday, there was no statement. The UK presidency of the Council did not emerge to say anything, even informally. Inner City Press is told that when China said there would be no statement, even if the Council waited all afternoon, the UK and US backed down “meekly,” as the source put it. Inner City Press asked Chinese Permanent Representative Li Baodong as he left if there would be a statement. They are still discussing it, he replied. 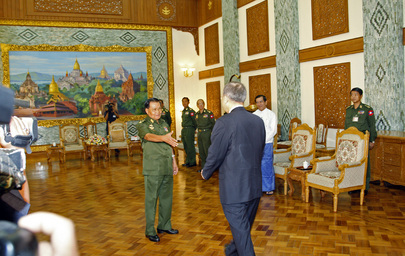 He said China has a long border with Myanmar and wants stability, through development. As Reuters reports, Than Shwe is already beating the drum for more investment after releasing ASSK. Just after the election, a representative of the Kachin National Organization Gum San Nsang told Inner City Press of problems along the border with China, which he perhaps diplomaticlly called a “good neighbor.” When Inner City Press asked about this, standing with Japanese media, Li Baodong smiled and said, “China is a good neighbor to everyone.” Then he left to host of lunch of the Council's Permanent Five members. Thursday afternoon, the Council has scheduled a closed door briefing about Guinea by UN envoy Said Djinnit. Inner City Press is told that not only Russia but also Nigeria opposed the idea of the Guinea meeting, Nigeria because “ECOWAS is doing something there,” one source put it. Therefore despite the state of emergency in Guinea, the source said, France may not even be proposing a statement, only the briefing. And so far nothing on the coup attempt in Madagascar. “It was a weird session,” the source said. “Everything got blocked.” And so it goes at the UN. Update of 4:30 pm -- to some's surprise, there were "Elements to the Press" read out by UK Deputy Permanent Representative Philip Parham, which we publish below as a public service. A source tells Inner City Press that during the consultations, Uganda referred back to the Council's November 16 stand off on Western Sahara and said it would have been good to have had the same enthusiasm and comity being shown on Guinea. After reading the element, Parham rushed from the microphone, taking not a single question. Maybe it's a UK thing? I’m just going to let you know about the discussion which the Security Council has just had about Guinea. The members of the Security Council were briefed by the Special Representative of the Secretary-General, Said Djinnit, on the situation in Guinea and the latest developments of the Presidential elections. The members of the Security Council welcomed the holding of the run-off elections on the 7 November in Guinea and the high voter turnout. The members of the Security Council took note of the provisional results as announced by the Independent National Electoral Commission on the 15 November. They urged all parties to follow the existing legal procedure, resolve their differences peacefully and respect the final decision of the Supreme Court. The members of the Security Council deplored the violence that has occurred in Guinea in the aftermath of the announcement of the results. They urged all political leaders in Guinea to refrain from any acts that could incite violence and to appeal to their supporters to remain calm. They further stressed the responsibility of national security forces and government officials to maintain public order and to protect civilians. The members of the Security Council paid tribute to the commitment of Special Representative Djinnit and ECOWAS and its mandated facilitator, President Blaise Compaoré of Burkina Faso. They also welcomed the coherent approach of the United Nations, the African Union and ECOWAS on this issue and they further welcomed the determination of interim President, General Sekouba Konate, to pursue peaceful elections in Guinea and encouraged him to continue this process until its successful conclusion in an inclusive manner across political lines. Thank you. UNITED NATIONS, November 16, updated -- As the Security Council started meeting about Western Sahara on Tuesday afternoon, all sides had and spread only limited information. At 4:15 p.m., Uganda's Ambassador Ruhakana Rugunda told Inner City Press that his country has proposed a full Press Statement calling for an investigative team to be send to Western Sahara. "Very sketchy," he called the information the UN provided. Inner City Press asked on November 12 and 16 if the UN has any first hand information about the murders in the Gdeim Izik camp in El-Ayoun. No, acting Deputy Spokesman Farhan Haq replied both times. 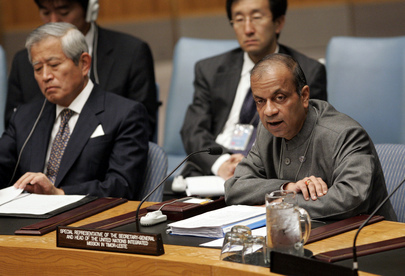 On what basis then was the UN's number two peacekeeper Atul Khare rushing into the Council eight minutes late? What possible information could he provide? Inner City Press has heard and reported that the UN Department of Political Affairs prepared its first statement about the violence while watching YouTube videos. And DPKO? Due to the lack of information, several delegations said they intended to ask for an investigation team. If DPKO has no information, one said, that is not normal, something will have to be done. Others, including one member state joining the Council in January, said this added force to the request to be made again in April for a human rights component to the MINURSO peacekeeping mission. But that's four months away, and things may have changed by then. A member said that language for a proposed “elements to the press” was being floated by Uganda, but that France would strongly oppose it. The US, too, was said to not favor any outcome to the meeting. Khare previously with Yukio Takasu, now in line for DPKO job? Two representatives of the Polisario Front spoke to the Press during the morning, while the Council met about Sudan. They spoke of a mass grave with 34 corpses, of MINURSO peacekeepers confined to their bases, under Moroccan surveillance, using vehicles with Morocco plates. One country on the Council with a particular interest is Mexico, in part because it has one of its nationals, Antonio Velazquez, hiding in the area, posting evidence to YouTube. Mexico took the lead in asking for the meeting, but doesn't want to be seen out front. If Uganda proposes something, they are prepared to support. And Austria? Watch this site. Footnote: In other DPKO news, Inner City Press reported by Twitter on November 15 that former Japanese Ambassador Yukio Takasu is in line for a job as Peacekeeping Advisor at the UN. On November 16 Inner City Press asked UN spokesman Haq, video here. Polisario says that because people were afraid to go to the hospital, the number is under counted. Proponents of the number, on the other hand, say it is hard to hide dozens of bodies. Is this round and round debate being echoed in the closed door consultations? We will try to find out. With the highlighting of “bladed weapons” and abuse, it's reminiscent of the video of the violence on the Gaza flotilla. Technology and war crimes, while the UN closes its eyes. Update of 5:09 pm - the consultations are over, there WILL be "elements to the press," not the full press statement proposed by Uganda. Update of 6:08 pm -- Mark Lyall Grant of the UK came to the stakeout and read out the “elements to the press” reproduced below. Then as Inner City Press asked about MINURSO's lack of first hand information, Lyall Grant said “no more questions” and walked away. But as has become a pattern this month, he took not a single question. Morocco's Ambassador came next, speaking in Arabic. Inner City Press ran to the UN's North Lawn building for a stakeout about the G-20, at which French Ambassador Gerard Araud and his deputy were already standing, tending to their minister. Inner City Press asked about Chinese yuan, US Federal Reserve pouring out $600 billion and about IMF reform -- what that's another story. Watch this site. The members of the Security Council have been briefed by the Assistant Secretary-General for Peacekeeping Operations, Mr. Atul Khare, on the recent incidents in Western Sahara. Council members deplored the violence in El Aaiun and Gdaim Izyk camp, and expressed their condolences over the deaths and injuries that resulted. They reaffirmed their support for MINURSO and its mission. The members of the Security Council also heard a briefing by the Secretary-General's Personal Envoy Ambassador Christopher Ross. They offered their full support for his ongoing efforts and urged the parties to demonstrate further political will towards a solution.